Dionysos or Bacchus with his name in Roman times was born in Aegean (western ) Turkey. Therefore there are a large number of archaeological sites and temples dedicated to the god of wine in this region. Anatolia is the name given to the Asian part of Turkey which represents 97 percent of the country. The center of this land is a high plateau which extends on hundreds of kilometers. One of the main vine growing regions here is Kalecik near Ankara- the capital of Turkey- famous with the grapevine called Kalecik Karasi. Cappadocia is another wine growing area in the center of Turkey with the delicious white grape called Emir and 'Dimrit ' grape which gives medium quality of table red wines, a grape type which is also consumed fresh or dried. Vintage and land ownership in Cappadocia. Growing Grapes is rather a household activity in the region due to the small size of the vineyards which can be estimated like 40 to 70 acres per family. Because of the fact that Cappadocia is a mountainous region, villagers can not own large portions of land. However we can talk about a more or less equal distribution of land in the region, which means that although not all most of the villagers are land owners. But this land ownership can not go beyond the level of self-sufficiency in terms of agricultural production. The peasants in Cappadocia keep some of the crop for the family for the grapes by drying or boiling them to produce 'pekmez' (sort of grape juice). The land work in the region is attributed more to the old people. They go to the vineyard on a horse carriage most of the time mainly early in the morning. 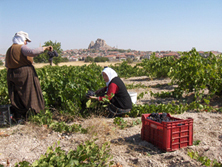 Collecting grapes in Cappadocia is an activity which starts from early September and extends to the beginning of October. The first grapes collected are the black ones which are mainly consumed as dry or sent to the factory to become grape juice. The grape has to be collected early in the morning before it gets hot. 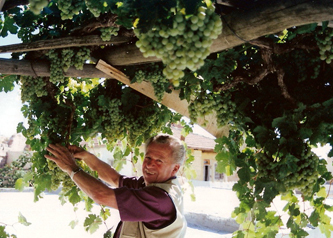 The white grapes are generally harvested later in the season usually after the mid-September and especially for 'Emir ' grape the collecting period can extend until the beginning of October. Grapes collected lately are used in two ways - to make pekmez and to produce wine. Collecting grapes in Cappadocia is an activity which starts from early September and extends to the beginning of October. The first grapes collected are the black ones which are mainly consumed as dry or sent to the factory to become grape juice. The grape has to be collected early in the morning before it gets hot. The white grapes are generally harvested later in the season usually after the mid-September and especially for 'Emir ' grape the collecting period can extend until the beginning of October. Grapes collected lately are used in two ways - to make pekmez and to produce wine. • 35 % are used to obtain grape juice, pekmez (sort of grape jam) and grape paste. • 4 % are used to produce wine. The first and the biggest wine company in Cappadocia, central Turkey. Founded in 1943 by Hasan Turasan. Established at Kavaklidere district in Ankara in1929. Second biggest wine company in Turkey. The factories are located near Ankara and in Cappadocia. with 6 gold and 17 silver medals in International wine contests.